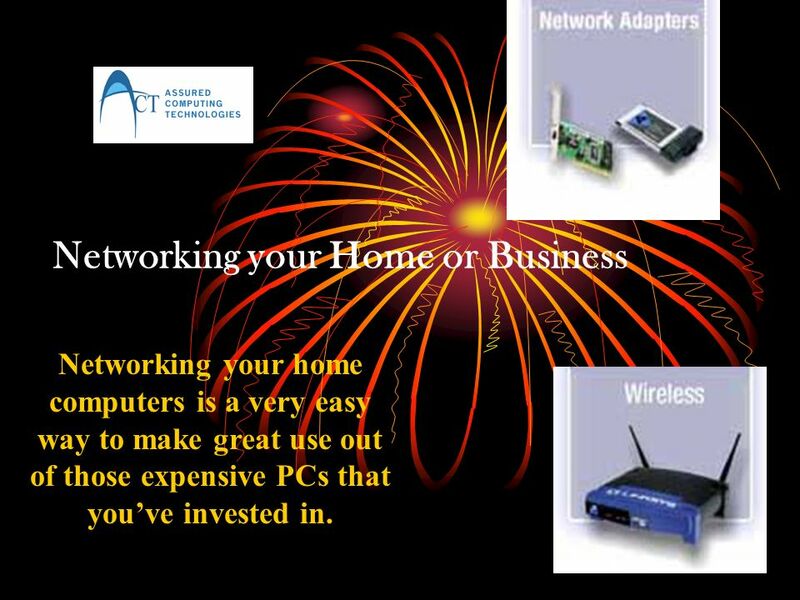 Networking your Home or Business Networking your home computers is a very easy way to make great use out of those expensive PCs that youve invested in. 1 Networking your Home or Business Networking your home computers is a very easy way to make great use out of those expensive PCs that youve invested in. 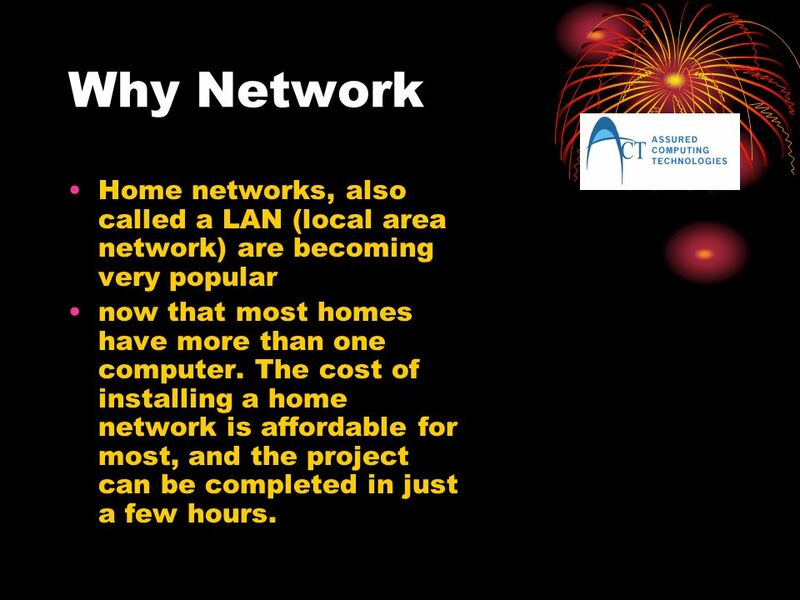 2 Why Network Home networks, also called a LAN (local area network) are becoming very popular now that most homes have more than one computer. The cost of installing a home network is affordable for most, and the project can be completed in just a few hours. 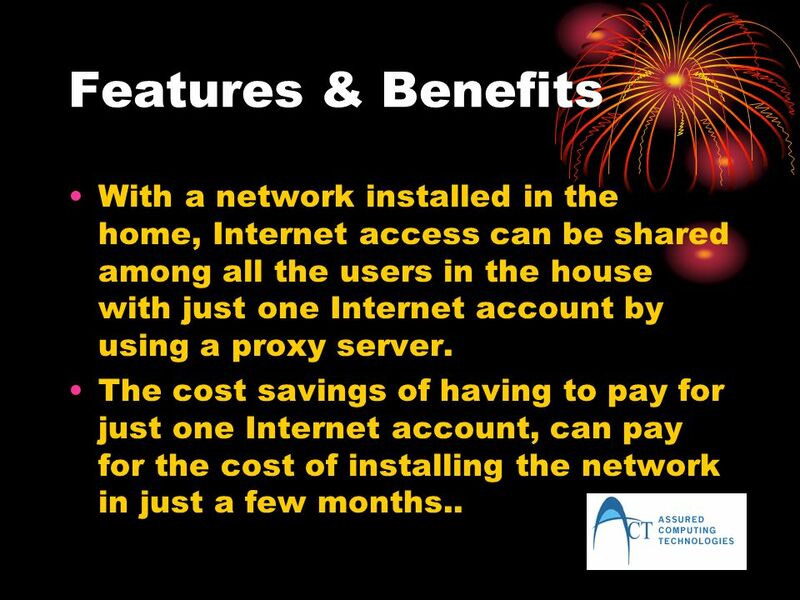 3 Features & Benefits With a network installed in the home, Internet access can be shared among all the users in the house with just one Internet account by using a proxy server. 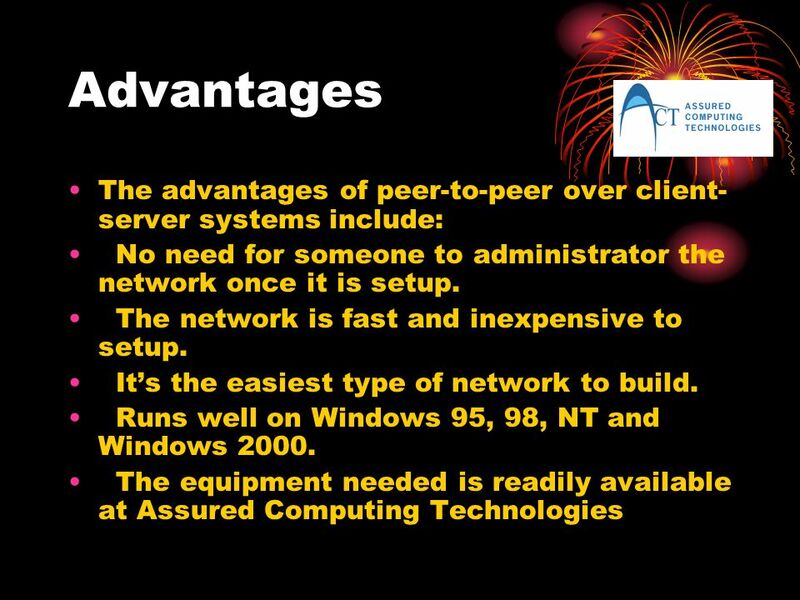 The cost savings of having to pay for just one Internet account, can pay for the cost of installing the network in just a few months..
4 The Fun Of Networking You know that old computer you have that doesn't have a CD ROM? No problem, with a networked computer you can use the CD on one of the other computers to transfer files, play games or look up the information the kids need for that book report. Everybody wants their own color printer huh? With your new network, they can all print to the same printer. No need to buy everyone in the house a printer. One printer can be shared among many users.. 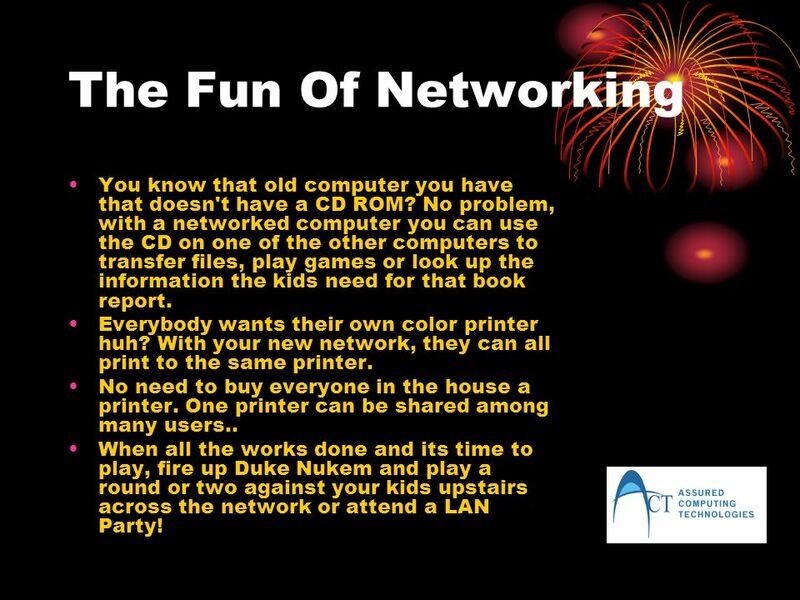 When all the works done and its time to play, fire up Duke Nukem and play a round or two against your kids upstairs across the network or attend a LAN Party! 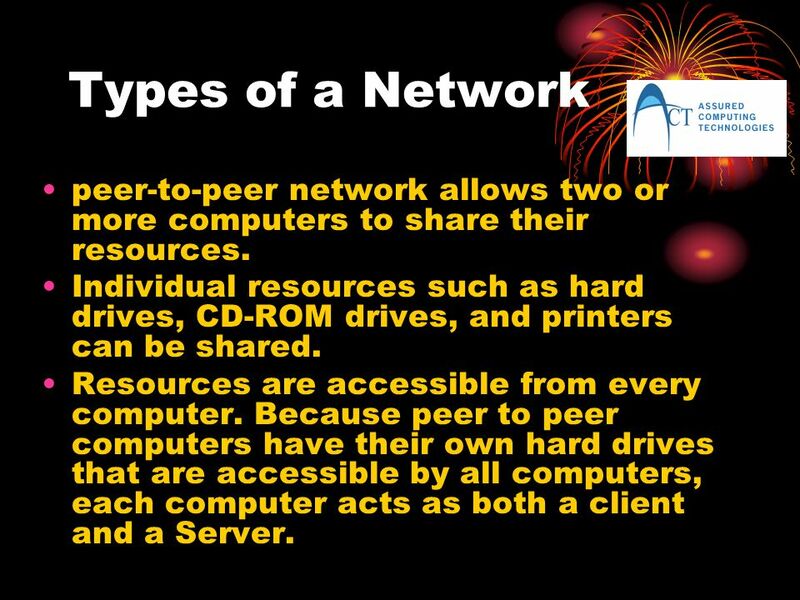 5 Types of a Network peer-to-peer network allows two or more computers to share their resources. Individual resources such as hard drives, CD-ROM drives, and printers can be shared. Resources are accessible from every computer. Because peer to peer computers have their own hard drives that are accessible by all computers, each computer acts as both a client and a Server. 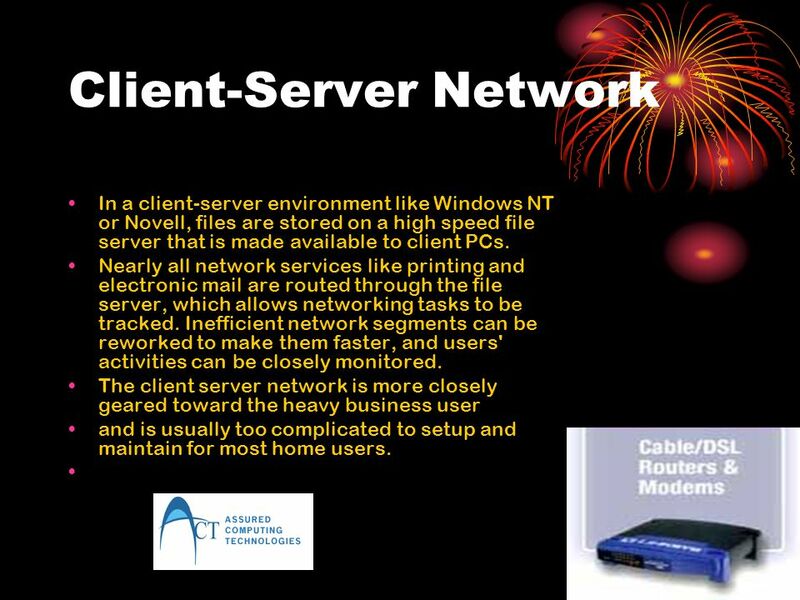 7 Client-Server Network In a client-server environment like Windows NT or Novell, files are stored on a high speed file server that is made available to client PCs. Nearly all network services like printing and electronic mail are routed through the file server, which allows networking tasks to be tracked. Inefficient network segments can be reworked to make them faster, and users' activities can be closely monitored. The client server network is more closely geared toward the heavy business user and is usually too complicated to setup and maintain for most home users. 8 Pricing Pricing is usually based on the design of the home or business to be networked. Assured Computing Technologies will be glad to do a no risk assessment of you home or business. 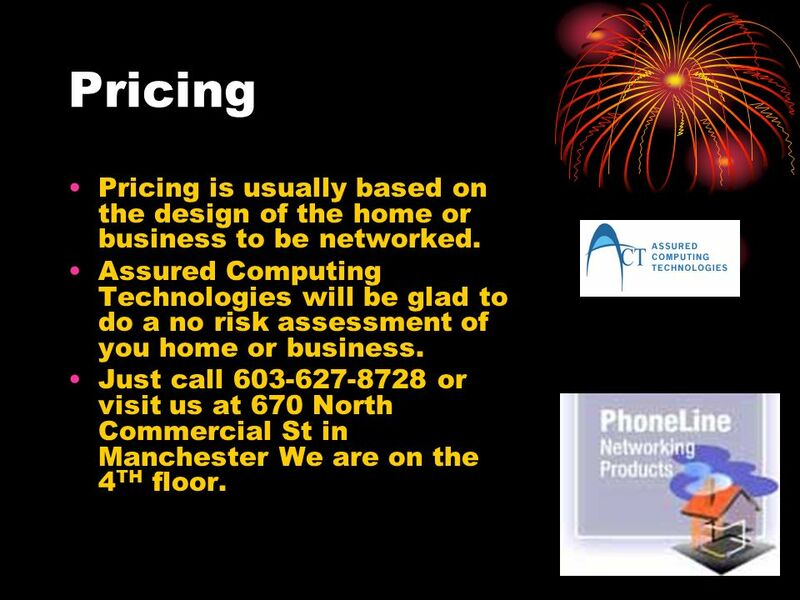 Just call 603-627-8728 or visit us at 670 North Commercial St in Manchester We are on the 4 TH floor. Download ppt "Networking your Home or Business Networking your home computers is a very easy way to make great use out of those expensive PCs that youve invested in." Computer Systems Networking. What is a Network A network can be described as a number of computers that are interconnected, allowing the sharing of data. Computer networks Fundamentals of Information Technology Session 6. Choosing a PC Before you choose a PC you need to think about what it is going to be used for. A new standard in Enterprise File Backup. Contents 1.Comparison with current backup methods 2.Introducing Snapshot EFB 3.Snapshot EFB features 4.Organization. Networking Basics lesson 17. This lesson includes the following sections: The Uses of a Network How Networks are Structured Network Topologies for LANs. Window NT Workstation and Server. Windows NT refers to two products workstation server can act as both a client and server in a network environment. Networking Basics. The Hardware Side of Networking A network is two or more computers that have been connected for the purposes of exchanging data and. Network Done by: Athra sultan. Teaching and Learning with Technology  Allyn and Bacon 2002 Introduction to Personal Computers in the Classroom Chapter 3 Teaching and Learning with Technology. Introduction to Networks Networking Concepts IST-200 VWCC 1. Fundamentals of Networking Discovery 1, Chapter 2 Operating Systems. Chapter 7: Using Windows Servers to Share Information. Networks and Hackers Copyright © Texas Education Agency, 2013. All rights reserved. 1.